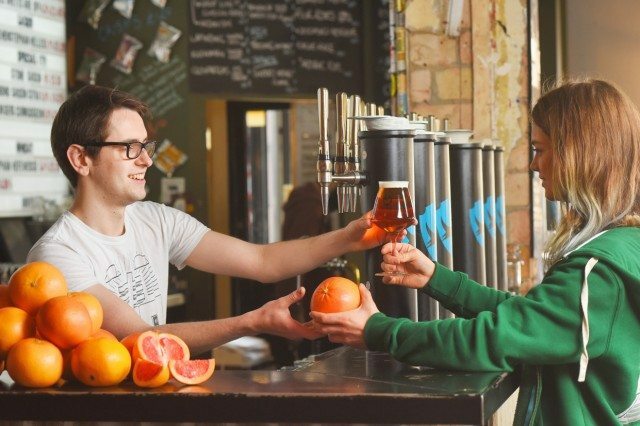 Forget Apple Pay – craft brewer and bar chain Brewdog is accepting grapefruits as currency in its venues to celebrate the launch of its new draught beer. The Scottish-based company is launching the fruity scheme across its UK bars, allowing customers to trade a grapefruit for half of its new Elvis Juice citrus IPA. The deal is only running from 6pm on Friday 4 March, and only one grapefruit per customer is being accepted, so beer fans should leave their sackfuls of fruit behind. All of the grapefruits collected will be shipped to the Brewdog brewery in Ellon, Scotland, to be used to make the next batch of the grapefruit-based beer. “As one-touch payment systems go, placing a grapefruit in the hands of a friendly BrewDog crewmember is about as easy as it gets,” the company said in a statement. Well being”handed a lemon” in exchange for a grapefruit doesnt sound like a great deal.